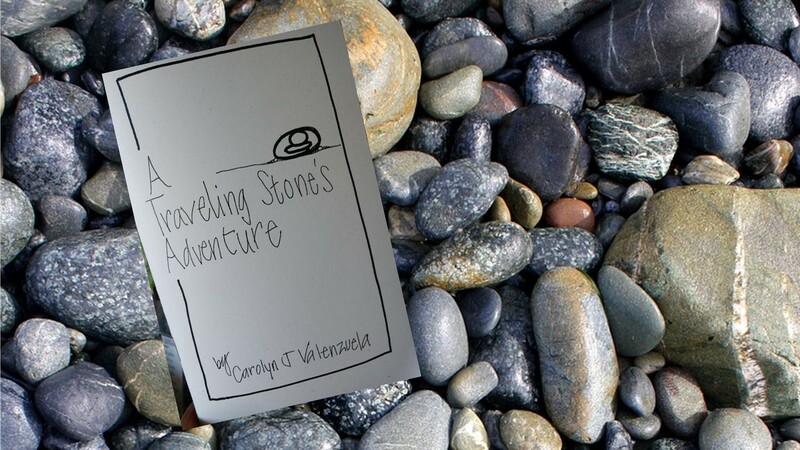 “A Traveling Stone’s Adventure” personifies the inanimate nature of a stone. The imagination is stoked to explore the magic held in all things. Imagine looking at a stone in the middle of a sidewalk with a wonder of how this came to be. As explained in the book, all stones begin as part of a bigger story. And if we can honor the adventure of a stone, what might we hold for others? Ram Dass said, “We are all just walking each other home.” Let this story ignite many conversations about the importance of things seemingly unimportant. Something like a stone, a tree, or even another person. Carolyn J Valenzuela is both the author and illustrator. These illustrations are a little more detailed than her other books. The reader may personalize the pages with color or doodles. Like a stroll along a path, little details easily missed, once captured expand the significance of the moment. Pick up and hold a stone to let it share its story. Good Morning Pam. I use WordPress. My web designer is https://www.onnawebdesign.com/. She supports my “theme”. One thing for sure is the gap between receiving a comment and responding. I need to talk with her to improve my interaction short of having to log in to find out if I have messages. Thank you for commenting and my apologies for the response time.